This week we turn our eyes to Asia as my friend Louis Gave of GaveKal gives us a very thought-provoking piece on the problems of investing in Asia, with a focus on China. While there are real opportunities, Louis also sees some speed bumps. Those Asian ETFs may not be the winners a lot of people think for structural reasons. I was to thank the team at GaveKal for letting me reproduce their research as typically it is only available to their clients who pay a rather hefty sum. This has been a productive weekend book writing wise. I am down to finishing 2 chapters which are mostly written and two long flights to Vancouver in front of me. Then the hard part of re-writes but I can see the end of the race. Have a great week, and if you are in Vancouver be sure to say hello. 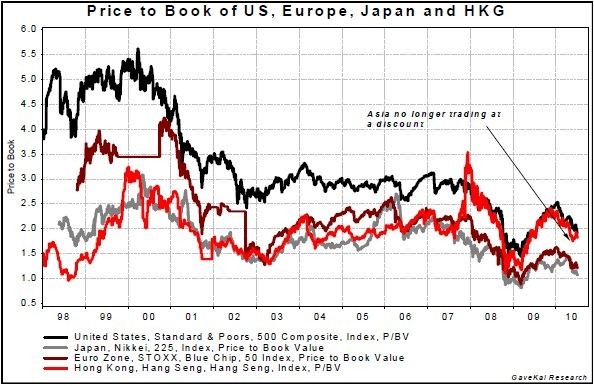 For the past decade, having an overweight exposure to Asian equities in a global equity portfolio was, by and large, the easiest 'major trade'; if only because Asia was both a 'return to the mean' trade (with very undervalued stocks in the wake of the Asian Crisis and TMT bust) and a 'momentum' trade (with faster growth). A decade ago, having stock-picking skills did not matter much in Asia. What counted was having the courage, foresight, and cash, to pick up dominant blue chips like Samsung Electronics at KRW35,000 or DBS Bank at SG$5. This valuation premium may of course be warranted given Asia's stronger growth outlook. But this also means that Asian equities really need to deliver on investors' expectations, or face a new de-rating. Or to put things differently, Asian equity markets are clearly no longer a positive 'return to the mean' trade. They are now a full blown 'momentum' trade. And unfortunately, lately, equity market momentum has not been too hot. But is the recent negative momentum a reflection of global trends? Or an Asia specific problem? And if it is the latter, then what does it mean for investors who have telecast plans to overweight Asia in their portfolios? The emergence of 3 billion new consumers, producers, and savers. What set off this dynamic megatrend was the interaction between three historic events - the breakup of the Soviet bloc, the opening up of China, and the end of proxy wars between communism and capitalism in the developing world. The result was that almost the entire world's population found their lives guided for the first time by the invisible hand of market forces, instead of being ruled by the iron fists of communism and feudalism or the clumsy robotic grip of central planning. Globalization transformed almost every economic activity in every country, as the principles of market competition, private enterprise, and free trade won universal acceptance after the breakdown of central planning and state ownership. In effect, the entire world economy started moving toward a NAFTA-style free trade area, if not quite a European-style single market. As this policy change interacted with the new technologies of zero-cost communications and cheap transport, the classical economic principles of specialization and comparative advantage began to operate with unprecedented effectiveness across the world. The result was an upsurge of productivity growth and wealth creation, especially in China and other previously backward Asian countries. This process of globalization transferred many manufacturing industries from the advanced economies to the developing world, vastly increasing the world's productive capacity. This transfer of industrial activity made the world economy more prosperous but also more stable, bringing us to the third megatrend. The Great Moderation--a period of unprecedented stability in inflation, unemployment, and economic cycles--created 20 years of almost continuous growth throughout the world economy that lasted right up to the recession of 2008-09. As the world began to recover from the recurrent crises of the 1970s and learned to live with pure fiat money, governments and central banks gained previously unimagined freedom to manage their economies and stabilize both inflation and unemployment. Policymakers gradually reverted to the active demand management that had been abandoned. Moreover, globalization stabilized the world economy by suppressing inflation and shifting many volatile manufacturing industries from America and Europe to China and other emerging economies. This transfer of industry not only made advanced economies less susceptible to inventory and capital investment cycles, but also helped to stabilize emerging economies, most notably in Asia, by reducing their dependence on subsistence agriculture, the most volatile industry of all. A Financial Revolution resulted from the adoption of a free-market philosophy, the buildup of savings in the rapidly growing Asian economies, and the stability created by globalization and successful demand management. With risks of bankruptcy and unemployment diminished in the stabilized economies of the 1990s, businesses and consumers felt that they could borrow more than ever before and banks were more willing to lend. Meanwhile, the demystification of money meant that debt ceased to be a moral or theological issue and became just another consumer product. Financial innovation also meant that savings previously locked up in property and other illiquid assets could be used as collateral to support consumer and business borrowing. This attractive new feature of property, summed up in the saying "my home is an ATM machine," led to an increase in the value of homes relative to other more traditional investments such as stocks and bonds. The result of this revolution was that ordinary homeowners and small businesses gained opportunities to smooth their spending over their entire lifetimes and to manage their finances in ways that had been available only to large multinational companies and wealthy family trusts. This financial revolution was responsible for the boom-bust cycle that exploded in the 2007-09 crisis, but the changes in traditional attitudes to debt, in property values, and in views about reasonable levels of borrowing may now have changed structurally? Looking at Asia, the first two of these four megatrends--the emergence of three billion new capitalists, both producers and consumers, in Asia and the unification of the world economy into a single market--are hopefully still on track and have not been derailed by the Great Financial Crisis. Meanwhile, the 'Great Moderation', currently a discredited notion in the West, is still a visible reality in the East (if only because, as mentioned above, Asia is still weaning itself off an highly unpredictable agricultural cycle). Simultaneously the 'Financial Revolution' is still only now unfolding its many benefits on the Asian financial landscape (see What Will 2009 be Remembered For?). In short, Asia today looks nothing like most Western markets who are confronting two very serious problems. The first problem the OECD faces is that over the past decade the private sector has created a lot of assets (real estate in the US, Spain, UK, Ireland...) against which a considerable amount of debt has been collateralized by commercial banks. As the prices of these assets fall, a Fisher-like "debt deflation" looms. The second problem is that, for structural reasons, a growing number of OECD countries are confronting a very challenging budgetary situation. As we reviewed in our latest Quarterly, the credit crunch, bank bailouts and recession only account for 9% of the increase in long-term public debt burdens in major advanced economies. The remaining 91% of the long-term fiscal pressure is due to the growth of public spending on pensions, health and long-term care. In other words, the credit crunch and recession did not create the present pressures on public borrowing and spending. They merely brought forward an age-related fiscal crisis that would have become inevitable once a majority of the baby boomers retired around 2020. The solution to the first problem is simple monetary economics 101: central banks have to buy assets in the hope of preventing a collapse in asset prices. These purchases need not be accompanied by a rise in the budget deficit. Instead, they trigger a sharp rise in the local monetary base which is not inflationary as long as the prices of the underlying assets do not go up; and if credit creation in the private sector remains muted, they are unlikely to do so. The rise in the monetary base compensates the decline in bank lending and the decline in the velocity of money. Over time, the hope is that these assets stabilize and gradually move off the central bank's balance sheet. In the near term, the central bank's action also usually leads to a weaker currency which in turn allows for an 'exportled' growth rebound. The solution to the second problem is, however, far more painful and there is little the central banks can concretely do to help. Instead, the onus is on governments to start cleaning up their balance sheets and income statements. This process may have started in the UK, and perhaps in Japan and certain European countries, though not without some backlash (witness the sudden stress that President Sarkozy finds himself under now that he is genuinely trying to tighten the government's belt). Meanwhile, in the US, there have been few concrete measures to encourage the market that the right steps are being taken (the healthcare debacle was clearly a missed opportunity) and the rhetoric has grown increasingly anti-business (bashing of banks, bashing of insurance companies, bashing of big oil...). Confronting the above dilemma, the natural reaction of central banks should be to follow Bagehot's advice to 'lend freely and at a high price' otherwise, the risk is that nothing will be done to address the 'unfunded' problem. Worse yet, Western economies could fall into the trap of what Jacques Rueff called 'subsidizing expenditures that give no returns with money that does not exist', a path which invariably leads to inflation. Even more worryingly, such a path could conceivably lead to growing suspicion of the fiat monetary system, which, as Anatole reviews in Capitalism 4.0, has been the bedrock of the post Breton-Woods economic miracle. Obviously, Asia has neither of the above two problems...which helps explain why most investors are today keener on increasing their risk in the East while decreasing their risk in the West. But of course this does not mean that Asia does not offer investors challenges. A cliché among professional investors is that the four most expensive words in the English language are "This time it's different." But while it is dangerous to ignore the cyclical nature of financial markets, and of human behavior more generally, it is undeniable that the driving forces of economic and business activity--technologies, social structures and political institutions--can and do change. Thus, as we have argued many times before in various GaveKal papers, the four most expensive and foolish words in the English language are not 'This time it's different' but 'Everything's always the same.' At least, this much is obvious to anyone who has spent time in Asia in the past decade. And in the category of 'this time it's different', the fact that most Asian countries are now tightening monetary policy before the Fed, BoJ, ECB and BoE must count for something. To some degree, this is good news as it shows a willingness on the part of Asian central bankers to tackle the continent's nascent inflationary problem. It also shows a certain degree of confidence that Asian central bankers always seemed to lack before. So, on a structural basis, it is encouraging. However, the hawkishness of Asia's central banks also means that while OECD yield curves are steep and likely to remain so for the foreseeable future, Asian yield curves are now flattening rapidly all across the board. In the charts below, the blue line is the yield curve in late 2007, the grey line is the yield curve a year ago and the red line is the yield curve today. One amazing development is how the US (and German) yield curves have, in the past year, continued to shift lower in spite of the economic recovery. In Asia, we are seeing exactly the opposite with yield curves flattening (Malaysia, Indonesia, China, Thailand, Australia...) or shifting higher (India), a divergence in trend which can only logically be explained by the differences in monetary policy. And, of course, this should logically have an impact on currency markets since steep yield curves often weaken currencies, while flat or inverted yield curves strengthen them (cash becomes harder to find hereby inviting companies and individuals to repatriate capital from abroad etc.). In other words, the differences in monetary policies between the East and the West should ensure that Asian currencies remain well bid. But it also means that most Asian indices face some new headwinds. Indeed, most Asian equity indices are typically comprised of 20-25% of exporting stocks (which should struggle as Asian currencies move higher) and 30-35% of Asian financials (for whom the flattening yield curves could prove a headwind). In other words, investors into Asia who decide to solely get exposure through benchmark ETFs are likely investing more than half of their money in what should prove to be 'dead money'. Asia's very different cyclical and policy outlook argues against investing in indices and instead for concentrating on the parts of the market that will benefit from the higher currencies and lower long term interest rates. This of course includes long-dated Asian government bonds (see Managing Money in a Solvency Crisis), high-dividend yield paying stocks (which tend to always outperform when yield curves flatten and/or invert), utility stocks (see Assets to Own in a Triple Merit Boom), local consumption stocks and all the 'stable growth' stocks, whether pharmaceuticals, consumer staples, software and tech stocks, etc. Take China as an example where the local market peaked back in August 2009 and has since then given up more than a quarter of its value. Usually, in the midst of such a pullback, almost all stocks would be affected. But what is interesting is that in the past 12 months, stocks linked to local consumption, and which one would expect to hold up decently as yield curves flatten, have done precisely that. 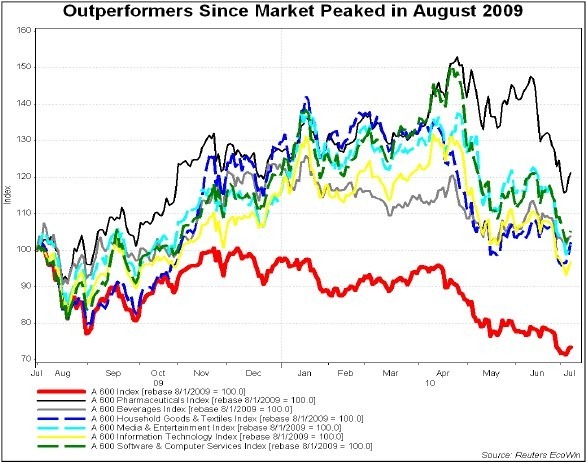 In a sign of unprecedented maturity for the Chinese market, most of the sectors listed above are actually trading at higher levels than they did when the Chinese market peaked in August 2009! 4- The Second Challenge: A Structural Shift? 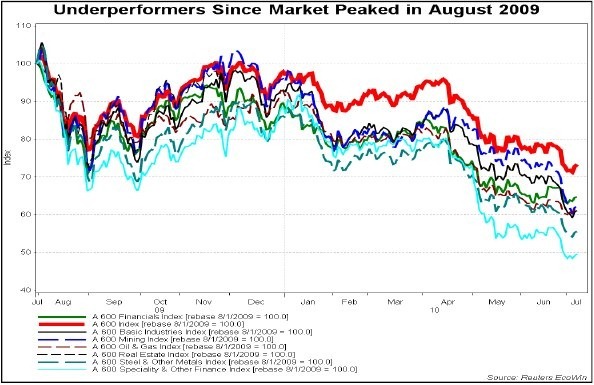 We would be remiss if we brought up the outperformers in China's current bear market without highlighting the sectors that have brought the index down. And here, one finds mostly the sectors one would expect to see penalized by a flatter yield curve, whether financials, steel and cement (since there should be less construction), mining, oil & gas, real estate, etc. (see chart below)... But this underperformance raises the question of whether China's economy (and to some extent Asia's as China is increasingly the largest motor of Asian growth) is simply going through a cyclical adjustment? Or a structural shift? The fact that the momentum of exports to the developed world is unlikely to continue at the blistering pace of the past decade, whether because of higher base effects or weaker Western currencies and demand. The fact that 'hard' infrastructure spending will lose steam, if only because a lot of the obvious infrastructure build-out (e.g., China's highways, high-speed rail lines, etc.) will soon be coming to completion. But most importantly, because the era of cheap labor is now squarely behind us (see The End of Surplus Labor from a recent CEQ). This means that, unlike what we have witnessed in the past decade, any future spending on infrastructure, whether by the government or entrepreneurs, can no longer be funded by squeezing labor. In a Marxist world in which added value is split between workers, capital and governments, the workers are about to get a fairer shake... which is great news for consumption, but bad news for infrastructure spending. And needless to say, when one buys an Asian ETF today, one buys an index that is heavily skewed towards a continuation of the infrastructure spending boom (i.e., steel stocks, coal mines, banks...), when what one wants to buy into is the unfolding Asian consumption boom (see our special report on Peak Sports, a Chinese sports shoe manufacturer and retailer for an interesting review of consumption trends in the Chinese heartland). Three years ago China's leading labor economist, Cai Fang of the Institute of Population and Labor Economics of the China Academy of Social Sciences (CASS), published a controversial book arguing that China's economy was about to hit a crucial turning point: the supply of "surplus labor" from the countryside was on the verge of drying up. Cai built on the development theory of British economist Arthur Lewis, who showed that early-stage industrial economies had two distinct sectors operating in parallel: a traditional agricultural sector with low productivity, and a modern capitalist sector with high productivity growth. In the early stage of industrialization, the impoverished traditional sector provides a large labor pool for the modern capitalist sector, which offers higher wages. This pool is at first effectively infinite, because the capitalist sector can continuously raise its demand for labor without raising real wages--or at any rate, raising wages well below the rate of productivity growth in the capitalist sector. But at some point--a moment dubbed the "Lewis turning point"--the pool of labor in the traditional sector becomes smaller than the demand for labor in the capitalist sector, and this changed supply-demand balance requires real wages to rise. In the first industrial revolution in the United Kingdom, real wages were static from the late 18th century until about 1840; after that they grew smartly. Japan hit its 'Lewis turning point' around 1960 and experienced very rapid wage growth thereafter. Cai's book asserted that China was about to hit the same turning point. With the supply of young workers entering the labor force set to drop by onethird over the next dozen years, it now seems obvious that Cai was right and 2010 may well mark the year in which China hit its 'Lewis turning point'. This is a momentous change: for years, businesses have simply assumed that China has an unlimited supply of young people who can be had for modest wages and replaced at will. Over the next 15 years this will cease to be the case: businesses will have to pay more for entry level workers, and then work harder to retain them for longer, because they will not be so easy to replace. The macroeconomic consequences of the Lewis turning point are large. Before the turning point, the capitalist economy grows mainly through an accumulation of factors - labor and capital. The efficiency with which those factors are used - in economists' jargon, "total factor productivity" or TFP--is secondary. After the turning point, sheer factor accumulation slows down, and efficiency or TFP gains must become the main driver of economic growth. In our view, this is now the most important question confronting Asian bulls such as ourselves: can Asia evolve from growth through accumulation of factors, to growth through productivity? The answer to the above question would require another GaveKal book (and one that we may yet research and write should we find the time!) but regardless of the longer term trend, one thing now seems obvious: a certain amount of economic rebalancing will occur naturally, as households will grab a bigger share of national income, increasing their consumption power. This means that the central "imbalance" in China's economy, namely the excess of thrift, could soon start to abate and this should not be without consequences (for global interest rates? Global currencies? Regional growth? Etc...). While it is important for a developing country to have a high national saving rate to finance large-scale investment in industry and infrastructure, it is true that China has taken this rule to an extreme: it saves and invests too much, and consumes too little of what it produces. In their intensive development eras, Japan, South Korea and Taiwan enjoyed peak national saving ratios of 35-38% of GDP. China maintained a similar saving rate in the 1990s and early 2000s, but after 2003 the saving rate soared, reaching 52% of GDP in 2009. This enabled China to finance investments totaling 47% of GDP, ten points higher than the peak ratios in earlier East Asian economies. 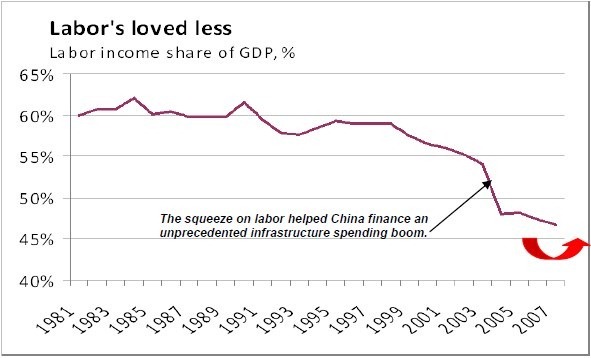 And while we do believe that these absolute numbers are exaggerated, thanks to the chronic inability of the Chinese statistical system accurately to count consumption of services, the trend of rapidly rising national saving and investment, to levels that are almost certainly unsustainable, cannot be denied. The question of why China saves so much has sparked much debate among economists. Some believe the rising saving rate reflects an increased tendency of households to save, because of an ever-more patchy social safety net, or for lifecycle reasons. Others (including ourselves) have argued that the main contributors to national savings have been ever more profitable companies and a parsimonious government. Usually, the debate boils down to an argument about how to interpret the "flow of funds" data in the national accounts, which track the sources of income in the whole economy. These data are of questionable quality, frequently revised, and hard to square with other economic statistics. Happily, recent careful work by two economists at Tsinghua University, Bai Chong'en and Qian Zhengjie, resolved many of these difficulties and made clear that virtually all of the increase in China's national saving since 2000 has been in the corporate and government sector. Bai and Qian reconciled national data with detailed provincial data, and found that the corporate saving rate rose from 16% of GDP in 1997 to 23% in 2004, after which it remained roughly constant. Government savings (much of which represents investments in infrastructure) exploded from 4% of GDP in 2002 to 12% in 2007. Household saving remained roughly constant at 15-17% of GDP during the whole 2000-07 period. And over that period, households tended to save a constant share of their income, a bit over one-quarter. So household saving was roughly constant both as a share of GDP and of household income. But household consumption plummeted, from 46% of GDP in 2000 to 35% in 2008. If household saving was constant but the household consumption share of GDP fell, the only possible explanation is that household income's share of GDP also fell. And this is precisely what Bai and Qian found: by analyzing national and provincial data they estimate that the labor income share of GDP fell by 7 percentage points from 1997 to 2007. Since the mid 1990s, Chinese wages have grown fast, but not as fast as GDP. As a result, household incomes - which are mainly a function of wages--grew slower than GDP. Consequently, household consumption's share of GDP also fell, even though households were not saving any more of their income. So if the government wants to boost the consumption share of the economy, it must try to boost the labor income share of GDP. In order to do so it must first understand why the labor income share fell so sharply in the first place. Bai and Qian's answer to that question is straightforward. About two-thirds of the drop in the labor income share can be explained by the economy's structural shift from agriculture, where the labor income share is around 90%, to industry, where the labor income share is typically less than 50%; most of the remaining fall in the labor income share can be explained by a fall in the labor share within industry, mainly thanks to the restructuring of the state-owned enterprises sector in 1997- 2003, which resulted in the layoffs of many workers, large new capital investments, and the setting of wage rates more in line with productivity growth. There can be almost no doubt that the sheer abundance of labor in the past two decades, which made it impossible for workers to bargain for a wage that matched the huge productivity growth being generated in industry, played a crucial supporting role to the processes described by Bai and Qian. But as labor becomes more scarce, wages will have to be bid up until they match or exceed the rate of productivity growth. This is what we are now witnessing all along China's coast (e.g. : Honda, Foxconn, etc...) Once wages grow faster than productivity, the labor income share of GDP will start to grow, and household consumption will begin to assume its rightful place as the main motor of the Chinese economy. Asian currencies will remain well bid for the coming year and likely thereafter. Long-dated Asian government bonds are increasingly the best hedge against equity risk for any portfolio. After all, if the twin 'fat-tail' threats to equity markets today are a) a double dip recession in the US and b) a solvency crisis in Europe, then long-dated Asian bonds can immunize the risk from either of these events... at least, this is what has happened in the past quarter! Asian indices and ETFs are likely to suffer as the markets adjust to the new realities reviewed above; realities that are all too often under-represented in benchmarks. Investors deploying capital in Asia should do so with managers willing to stray massively from any benchmark. Within the Asian equity markets, we would favor high-dividend yield paying stocks, utility stocks and stable growth stocks, especially those linked to the consumer. Stocks linked to the infrastructure roll-out (steel, commodities, etc...) should be seen as a trade at best, or simply avoided, even if valuations now appear attractive. Such stocks were the main driver of the past decade's Asian boom. They will not be the leaders of the next decade. As Francois-Xavier argued in a recent ad hoc comment (see The New Export Champions), going forward, Europe's machine tool and capital good exporters may not be the top performers in a portfolio of exporter stocks. Instead, investors should focus on the Western world's service exporters.